It's good to see butterflies, especially monarchs, getting so much press. Now let's see if we can press the issue. The Washington Post just published an article in its style section: "Butterflies Were Symbols of Rebirth. Then They Started Disappearing," chronicling the history--as we know it--of butterflies. 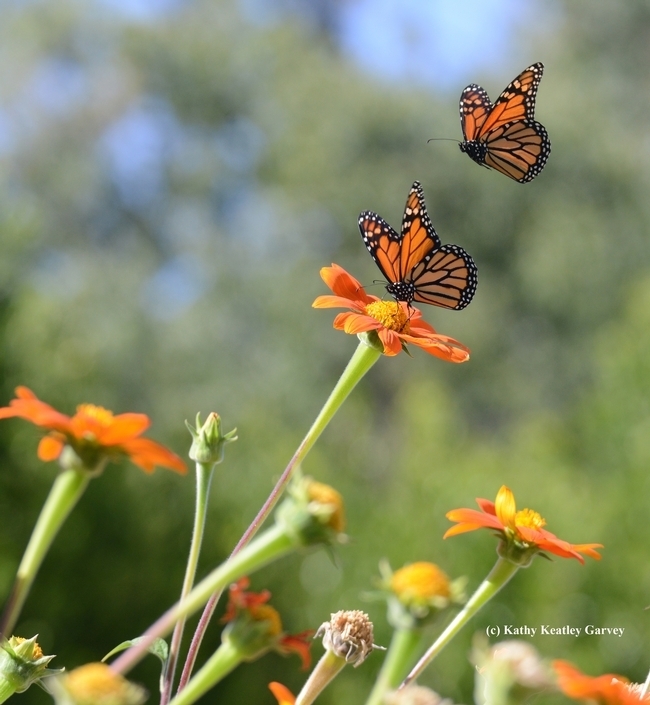 For his in-depth piece, reporter Dan Zak interviewed butterfly guru Art Shapiro, distinguished professor of evolution and ecology at UC Davis, who has monitored the butterfly population in Central California since 1972 and maintains a research website. The Washington Post reporter mentioned the monarch butterfly summit held Feb. 28 in the Putah Creek Lodge, UC Davis, where invited guests of the Environmental Defense Fund discussed "Recovering the Western Monarch Butterfly Population: Identifying Opportunities for Scaling Monarch Habitat in California's Central Valley." How serious is it? 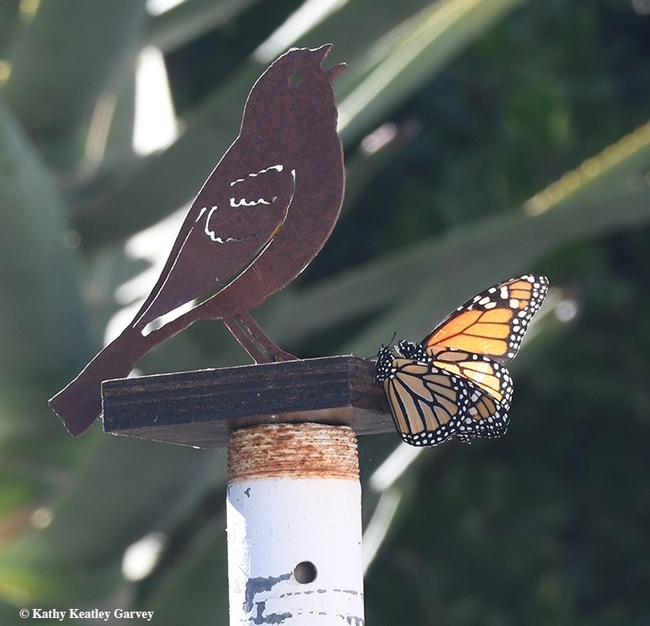 "The latest population surveys indicate that monarchs overwintering on the central coast have declined 86% since last winter and now total 0.5% of their historical average," according to the agenda. Shapiro, one of the speakers, delivered a presentation on "What We Don't Know and What We Know That Ain't So About Monarchs" in which he declared that "monarchs are on life support in California, and we are reduced to prescribing placebos." (See Bug Squad blog.) 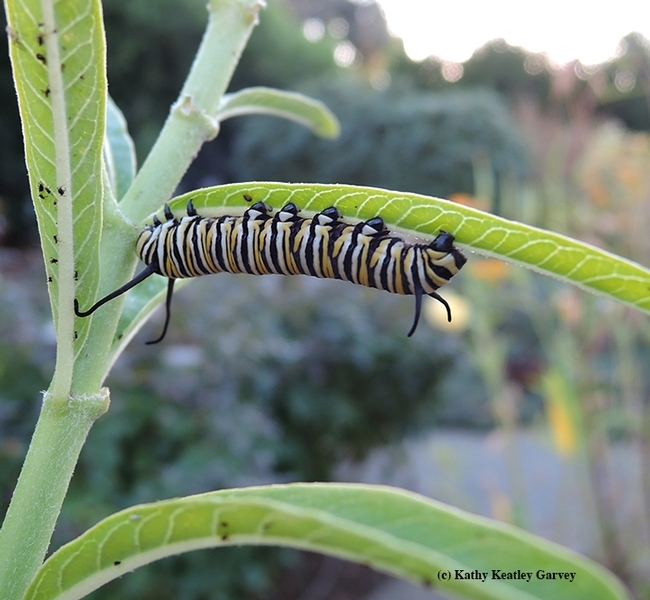 "I never saw a single wild Monarch larva in 2018—the first time since I became butterfly-aware in 4th or 5th grade!" he said. 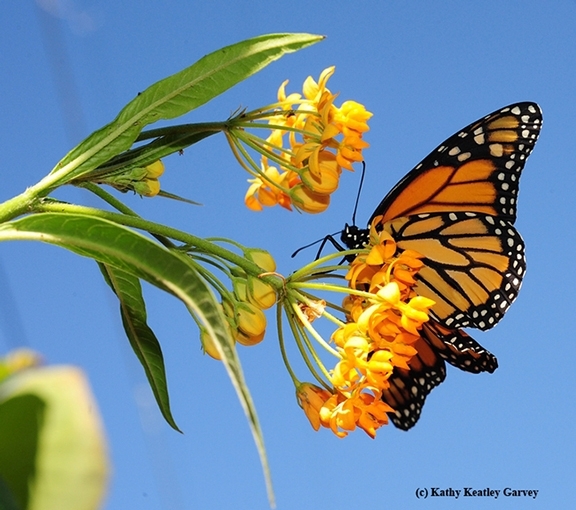 In his Washington Post piece, published March 6, Zak wrote: "There's compelling evidence that pesticides, deforestation and habitat loss are to blame for monarch decline. Climate change sharpens every threat by altering weather patterns, extending droughts, strengthening storms. It's easy to conclude, then, that we are responsible....Shapiro says we don't fully understand what's happening to butterflies, but he can't shake a feeling of responsibility." We experienced that a little of that level of frustration last year in our pollinator garden in Vacaville. We saw--and reared--only 10 caterpillars in 2018. Compare that to 2016 when we reared and released more than 60 monarchs. In 2016, we'd commonly see seven or eight at any given time all day long in the late summer and early fall. They'd stop for some flight fuel before winging it over to the California coast to overwinter. On Labor Day, 2016, we photographed a tagged migratory monarch from Ashland, Ore. nectaring in our garden. It was part of a citizen science project conducted by Washington State University entomologist David James. Very few migratory monarchs fluttered into our garden in 2018. Where are all the monarchs? Something indeed was--and is--happening. "For thousands of years, humans have looked to butterflies as a reassuring symbol in times of change," Zak wrote. "The Earth now is changing, and butterflies have become a symbol of something else: loss." Consider a doctor faced with a patient in rapid decline. All tests have failed to identify the cause. What is the doctor to do? You can't prescribe treatment for an undiagnosed illness, can you? You can make a wild stab at a prescription on the basis that the patient is going to die anyway, and MAYBE, just maybe, this drug will do some good. Or you can prescribe a placebo, just to reassure the patient that you are doing something. That's where things get interesting. Occasionally a patient improves drastically on a placebo. Maybe he would have improved anyway; there's no way of knowing. Suppose our patient has a complete remission despite having received only a placebo. Does our doctor convince himself the placebo cured him? As of right now, the Monarch is on life support in California, and we are reduced to prescribing placebos. If our patient comes back from the brink—as history suggests it may well—will we convince ourselves that our placebos worked? Probably. And that's not how to do science. That's what philosophers call the fallacy of post hoc, ergo propter hoc. We can do can do better than that! Meanwhile, Shapiro will be teaching a UC Davis graduate student course, "The Science of the Monarch Butterfly," on Tuesday nights, starting April 2, during the spring quarter. The course is set for 8:10 to 10 p.m. every Tuesday in Room 2342 in Storer Hall, located off Kleiber Hall Drive. He's inviting citizen scientists or others interested in the science of the monarchs to audit the course, for free. No reservations are required. When Cole Porter wrote “Let's Do It, Let's Fall in Love” in 1928, he wasn't thinking about butterflies. He was thinking of birds, bees and...well, educated fleas. As opposed to uneducated? “The Birds and Bees” soon became a euphemism for courtship and reproduction. "The Talk." Well, Cole Porter could have—should have--added "butterflies." Monarch butterflies. 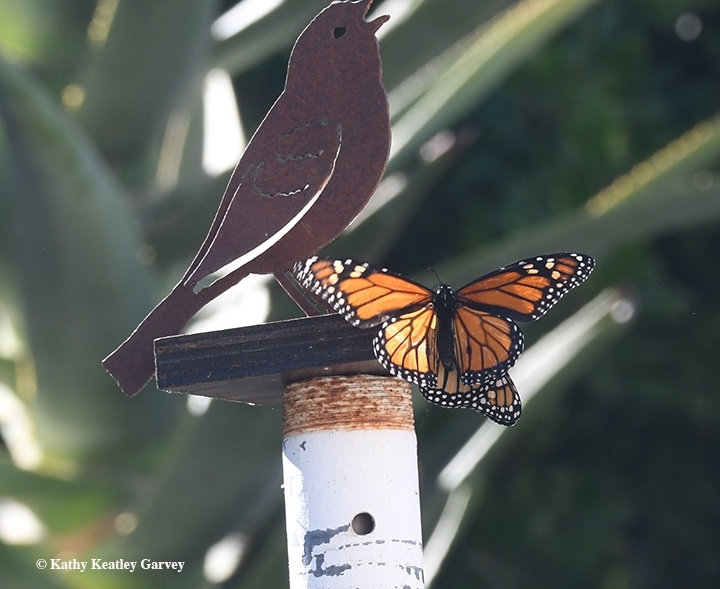 Especially considering the dwindling number of overwintering monarchs along coastal California. According to a Dec. 8 article in The Guardian, in the 1980s some 4.5 million monarchs overwintered in California, but today the number has dropped to about 30,000. That's a drop of some 97 percent, The Guardian noted. "We currently have preliminary count results from 97 sites, which includes many of the most important overwintering sites. In 2017, these sites accounted for 77% of the total monarch overwintering population, hosting approximately 148,000 monarchs. In 2018, the same sites have only 20,456 monarchs. This represents an 86% decline since last year." "We will not have final numbers until the count is over and all the data are in and vetted (usually late January)—and we will keep our fingers crossed that other sites are hosting more monarchs." Speaking of The Birds and The Bees, when migrating monarchs from the Pacific Northwest and inland California were fluttering to coastal California--and some were just eclosing--we encountered a courtship in Vacaville, Calif.
A bird: A metal sculpture nailed to a post. Butterflies: Two monarchs, Danaus plexippus...well...getting acquainted. Sadly, the statistics indicate--with or without educated fleas--a dismal spring for monarchs. We first saw her at 10 a.m. on Oct. 27, 2017. She was eating. That's what monarch caterpillars do best. They eat. A lot. "Where have you been?" I asked. "Where have you been hiding? Your siblings have long gone. 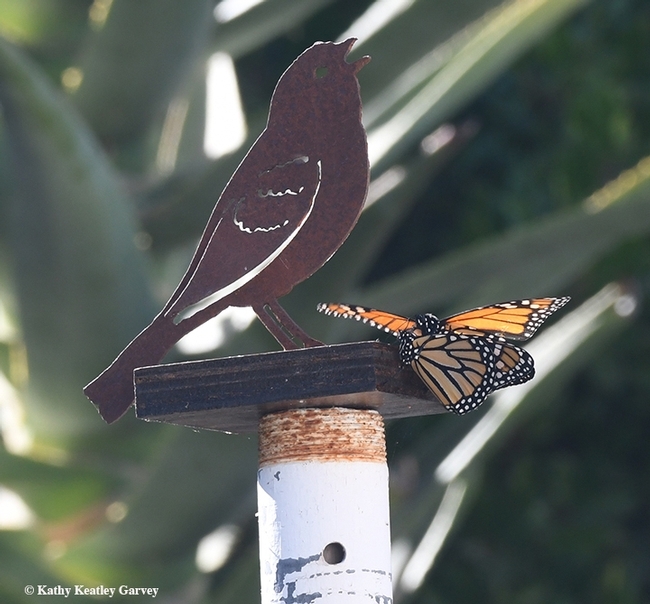 Your buddies passed through here in late August and September on their way to their overwintering sites in Santa Cruz and beyond." How could I have missed her? This one was a fifth in-star and almost ready to pupate. "Let's see. When your mama laid the egg, you hatched in about three to four days. You'll be a caterpillar for 10 to 14 days. Then you'll be in the pupa stage for 10 to 14 days. But that's all under normal conditions, summer conditions. This is fall, not normal conditions, little buddy." The chubby black, yellow and white monarch caterpillar kept eating. "YOU could have been eaten, little buddy," I told her, glancing at the hungry California scrub jays vocalizing in the cherry laurels. 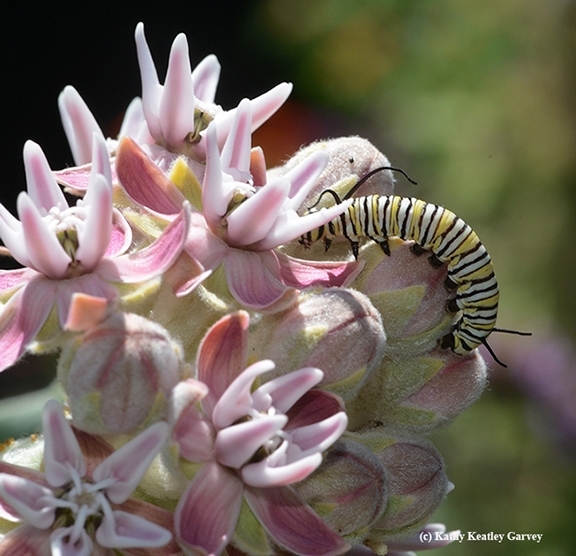 True, milkweed contains a poisonous toxin that protects monarchs from predators, but birds do eat them. "Just not as much," says Louie Yang, associate professor of entomology at the University of California, Davis. Then there are the other deadly encounters. Tachinid flies and braconid wasps parasitize the caterpillars and chrysalids. And some fall victim to that dreaded disease, Ophryocystis elektroscirrha, caused by an obligate, protozoan parasite. So, awed by her unexpected appearance, we prepared the indoor butterfly habitat for its last tenant of the season. Our monarch-rearing kit features a Patron tequila bottle; the narrow neck prevents the 'cats from drowning, and the broad, heavy base assures stability (this is one bottle that doesn't get tipsy!). Just add water, milkweed stems and the caterpillar, and center the bottle in the zippered habitat. Then you wait for the caterpillar to create a silk button and form a J. And then a chrysalis. And then an adult ready to generate more generations. This November tenant, however, chose the most fragile, overhanging milkweed stem in the bottle to pupate. No mesh ceiling for her! 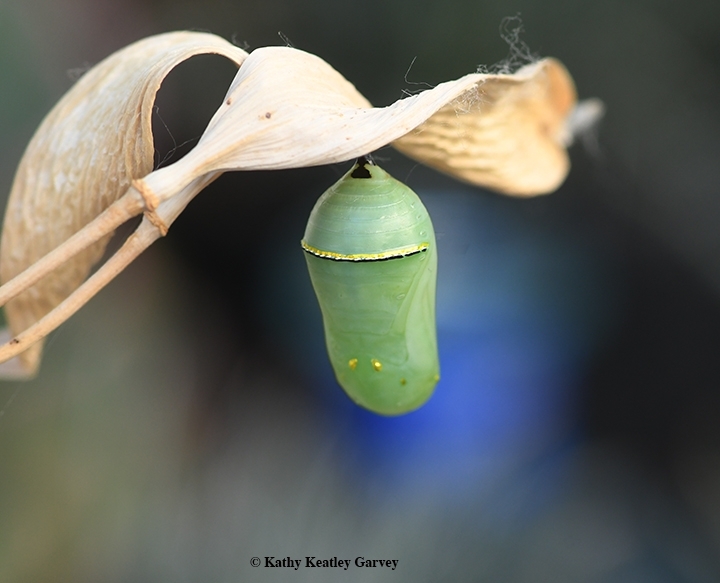 When the jade-green chrysalis formed on Nov. 4, it looked like a jeweled ornament dangling from a Christmas tree. Or a mid-life chrysalis. Now, "hurry up and wait." In ideal conditions, a monarch ecloses in 10 to 14 days. In ideal conditions. Nothing happened for 10 days. Then 12. Then 14. Then 18. On Day 19, Nov. 22 (the day before Thanksgiving), the chrysalis darkened, revealing the orange, black and white wings in all its transparency. The chrysalis bulged, throbbed and swayed. Out slipped the butterfly, wings flat, wings pumping. 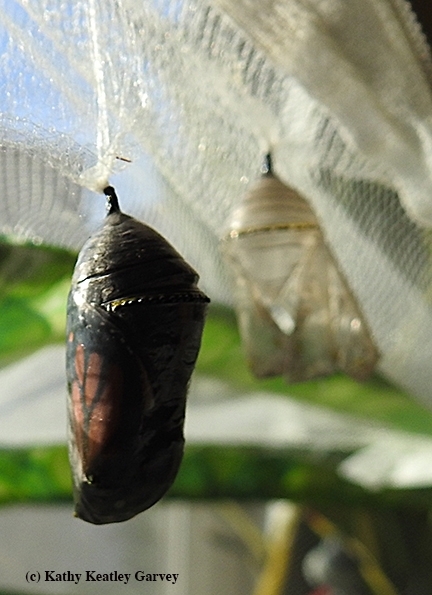 She clung to the pupal case as her wings expanded. A big, strong and healthy girl. 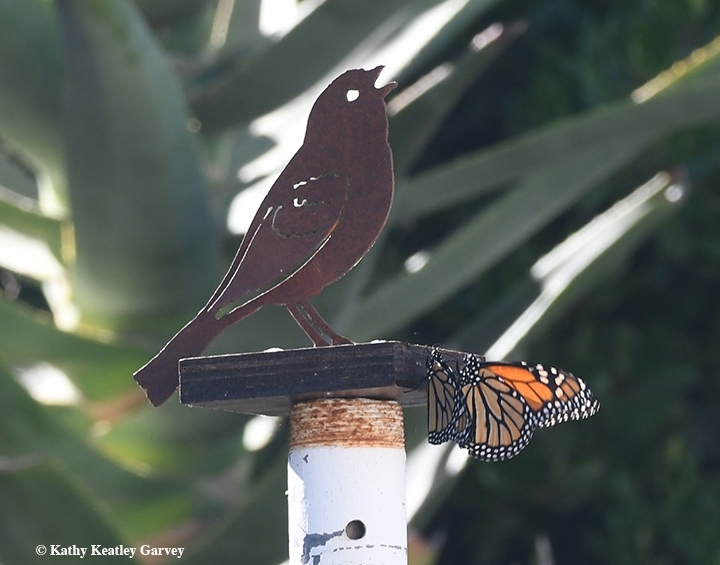 On Thanksgiving Day, four adults, two dogs and one butterfly celebrated in Casa de la Garvey. At least we think the butterfly celebrated. She dropped to the floor of her habitat and sipped orange juice and a honey/water mixture. Then, sustained, she fluttered up to her perch, and began searching for an opening, an escape. 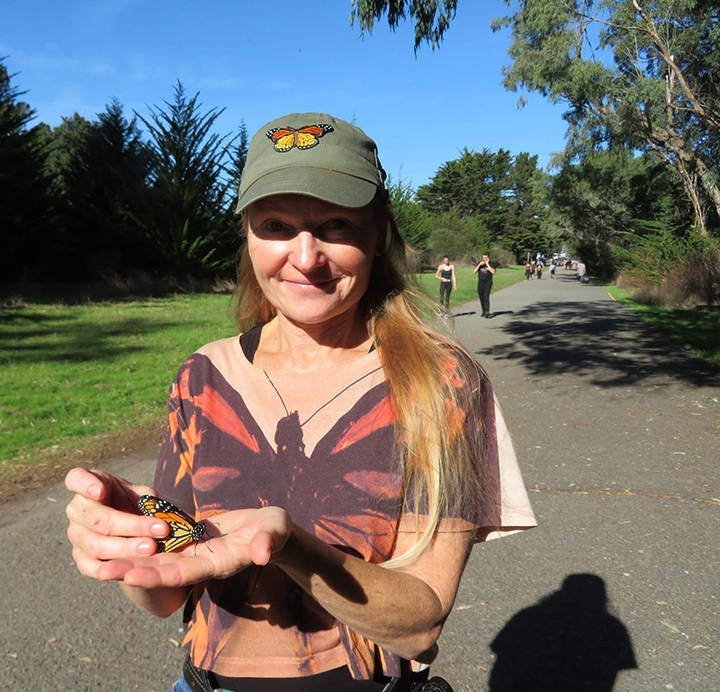 It just so happened that a friend and pollinator advocate, Rita LeRoy, the self-described "farm keeper" at the Vallejo School District's Loma Vista Farm, Vallejo, was heading to Santa Cruz on Friday, the day after Thanksgiving, to show her out-of-town relatives the overwintering migratory butterfly sanctuary at the Natural Bridges State Beach Park. That's about a 100-mile trip from Vallejo. Could Ms. Monarch hitch a ride? She could. And she did. Rita, who delights in showing area schoolchildren the monarchs that frequent Loma Vista Farm--she's also a Monarch Mom who rears and releases monarchs and is active in the Bay Area Pollinator Posse--unzipped the mesh habitat at the butterfly sanctuary. Her sister-in-law captured an image of Miss Monarch in freedom's hands. Wow! Just wow! From a caterpillar to a chrysalis to an adult. And there she was! In Rita's hands. In Santa Cruz. In the migratory butterfly sanctuary. With her buddies. Or soon-to-be buddies. "She flew so fast that we didn't get a picture of her flying away," Rita lamented. "She was anxious to join her new friends." "It was a beautiful day," Rita said, adding "Thank you for allowing me the pleasure of setting her free. I was so sad that my last ones (monarchs) didn't survive. It was really nice to have this happy experience." Monarch Mom Rita LeRoy, farm keeper at Loma Vista Farm, Vallejo, is ready to release the Vacaville-born and reared monarch at the butterfly sanctuary at Natural Bridges State Park, Santa Cruz, on Nov. 24. Migratory Monarchs Are on Their Way! Camera ready? Check. Notebook ready? Check! Entomologist David James of Washington State University, Pullman, Wash., who studies the migration routes and overwintering sites of the Pacific Northwest monarch population, told us last Friday, Aug. 25: "Many monarchs have been/are being tagged in Southern Oregon! One has already been recovered showing southern movement, so its likely they will be heading your way very soon!" 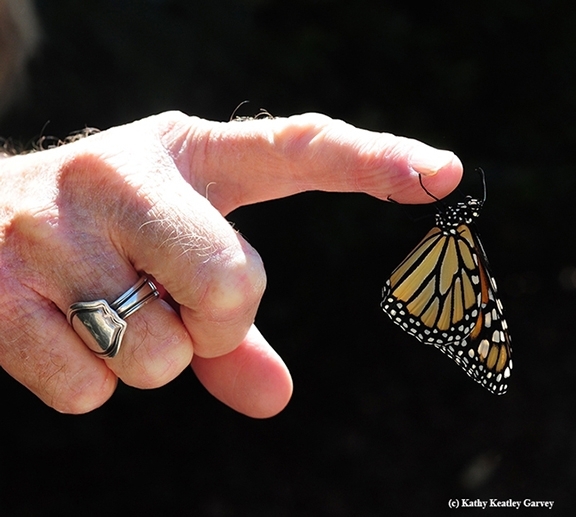 He maintains a network of Pacific Northwest citizen scientists who rear, tag and release monarchs. Last year on Sept. 5, Labor Day, a tagged monarch--a male--from his citizen scientist program in Ashland, Ore., fluttered into our yard in Vacaville, Calif. for a five-hour "pit stop" on his way to an overwintering site, probably in Santa Cruz or Pacific Grove. We followed him around, watching him sip nectar from Mexican sunflowers and butterfly bushes. Then we contacted James, sending him photos and information, and wrote about the encounter on a Bug Squad blog. The tag read "monarch@wsu.edu," and serial number "A6093," which tied the butterfly to Ashland citizen scientist Steve Johnson of the Southern Oregon Monarchs Advocates (SOMA). Johnson tagged and released "A6093" on Sunday, Aug. 28. 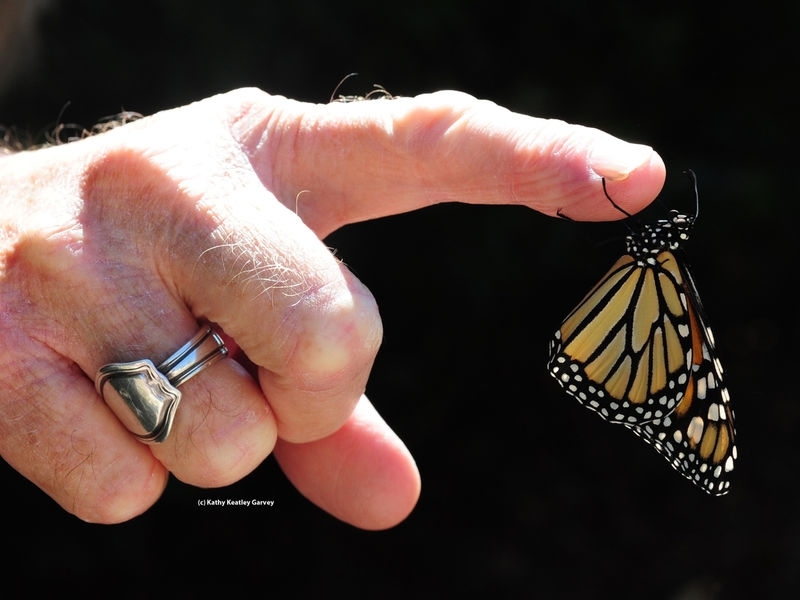 As far as we know, the Ashland reared-and-released monarch wasn't sighted again. Fast forward to this year. 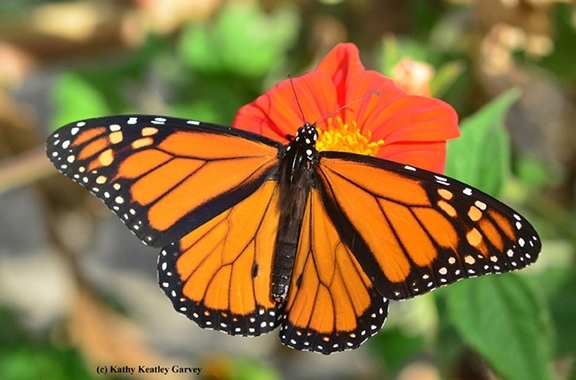 We are seeing fewer monarchs this year than last. 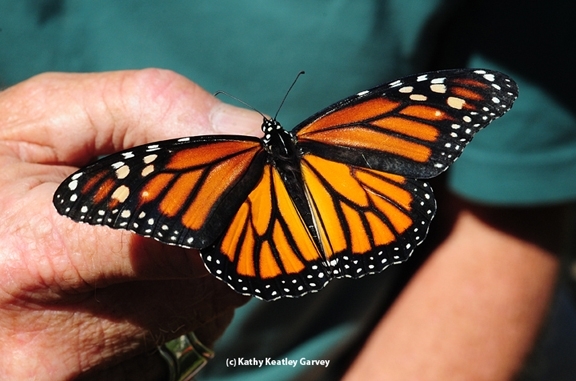 Last year we reared and released 60 monarchs in our small-scale monarch program. This season, however, we've noticed a drastic drop in the number of visitors to our pollinator garden, which includes plenty of milkweed, their host plant, and even more nectar sources. 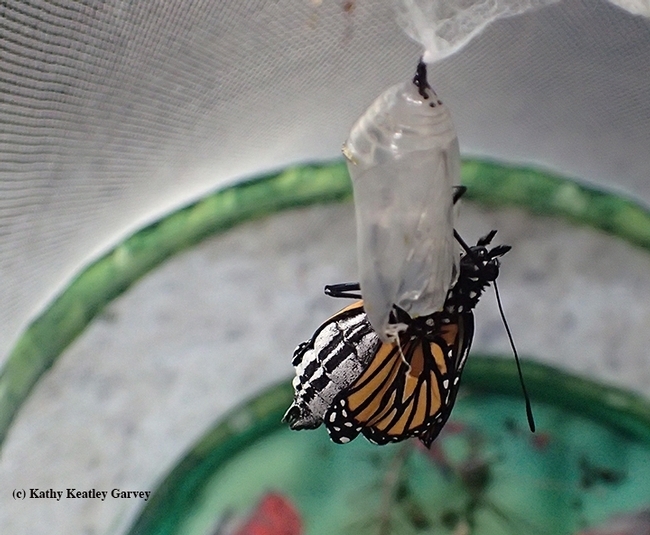 So far we've reared and released only four monarchs--three females and a male. Four chrysalids remain. "Yes, it's been a dismal year for monarchs in many areas of the West, unfortunately," James wrote in an email on Aug. 29. "I think it stems from the late winter storms that hit the California coast just as the overwintering colonies were beginning to disperse... I think the survivors that produced the first spring generation of larvae were fewer in number than 'normal.' Consequently, the next generation (that begins migrating into the Pacific Northwest) was also smaller than usual. Many areas of the PNW had very few monarchs this year." 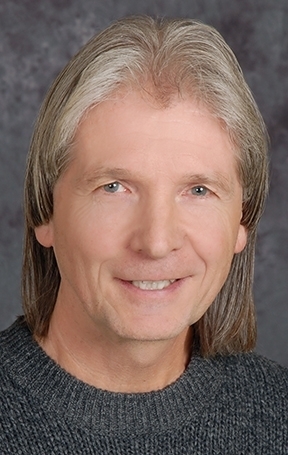 The good news, though, the associate professor said, is "that where monarchs did colonize in Washington, Idaho and Oregon, they had good breeding success, resulting in locally 'normal' or above normal sized summer populations. So I'm expecting an overwintering population comparable to last year. Thus, you should see a definite increase in numbers of monarchs coming through your yard over the next month!" We hope so! Meanwhile, keep a lookout for those WSU-tagged monarchs. If you see one, try to photograph it and mail the image and information to David James at monarch@wsu.edu. Looking back at 2016, monarch butterflies reigned supreme--or at least they did in this Bug Squad blog! Finding--and photographing--a tagged monarch butterfly (monarch@wsu.edu A6083) in our pollinator garden in Vacaville, Calif. on Labor Day, Sept. 5, highlighted the year. 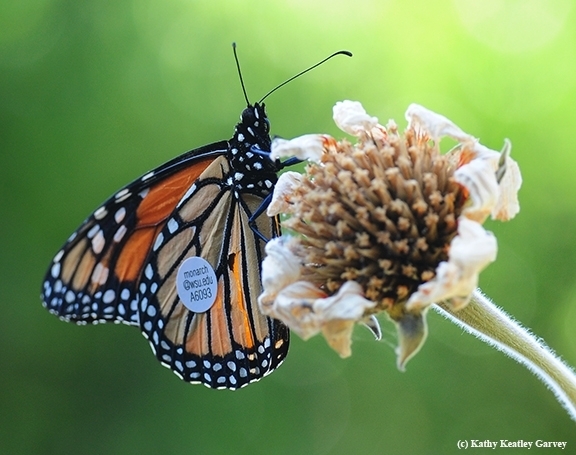 The migratory butterfly, a male, was part of a research project led by Washington State University entomologist David James, who maintains a network of Pacific Northwest citizen scientists who rear, tag and release monarchs (Danaus plexippus). Turns out that Steve Johnson of Ashland, Ore., a member of the Southern Oregon Monarchs Advocates (SOMA), reared A6083. Johnson tagged and released the monarch in Ashland on Aug. 28, which means "that it flew 285 miles in 7 days or about 40.7 miles per day" to reach Vacaville on Sept. 5, James related. Amazing! Amazing and serendipitous for several reasons: (1) I'd written a piece about James' research in October 2014, alerting readers to watch for tagged monarchs (and never expecting to see or photograph a WSU-tagged butterfly in our own backyard) (2) WSU is my alma mater, and (3) our family rears monarchs as a small-scale conservation project to help the declining monarch population. Our pollinator garden caters to bees and butterflies. For the monarchs, we provide four species of milkweed, ranging from narrow-leaf to broadleaf, and grow such nectar-producing plants as Mexican sunflower (Tithonia) to butterfly bush (Buddleia), and Lantana. This year our monarch-rearing season proved quite lengthy; it crept into winter. 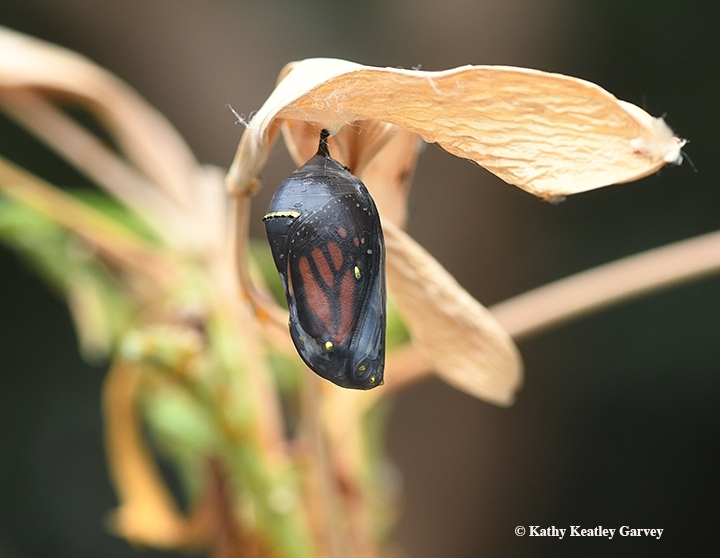 Monarchs continued to lay their eggs throughout November, with chrysalids forming in December. Today the reared-and-released tally is 62 and counting...counting because No. 63 eclosed Dec. 29 and has not yet been released, and No. 64 is still a chrysalis. 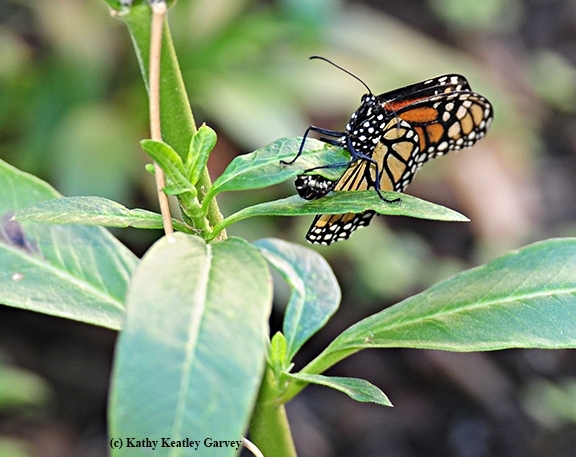 "Monarch Moms" and "Monarch Dads" and "Monarch Kids" differ in their rearing activities, but the concept is the same: protect them from predators and parasites. 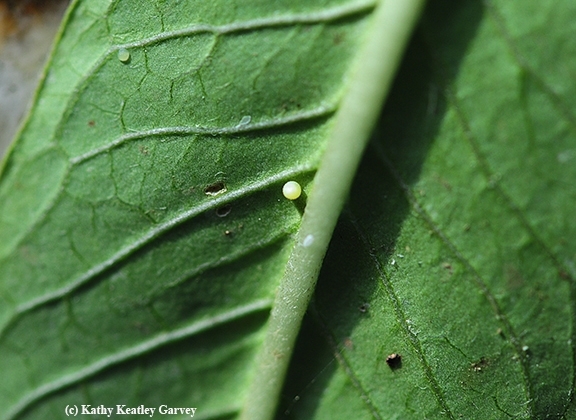 Otherwise about 97 percent of the eggs never complete the cycle of egg, caterpillar, and chrysalis to adult. 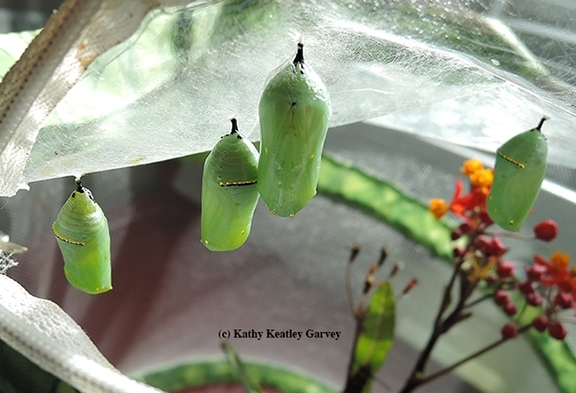 We rear our caterpillars indoors in a zippered, meshed butterfly habitat (purchased from the Bohart Museum of Entomology, UC Davis), but some laundry bags will suffice. We fill a heavy, flat-bottomed, narrow-necked tequila bottle with water and just add milkweed and 'cats. There they munch on milkweed, pupate, and eclose. 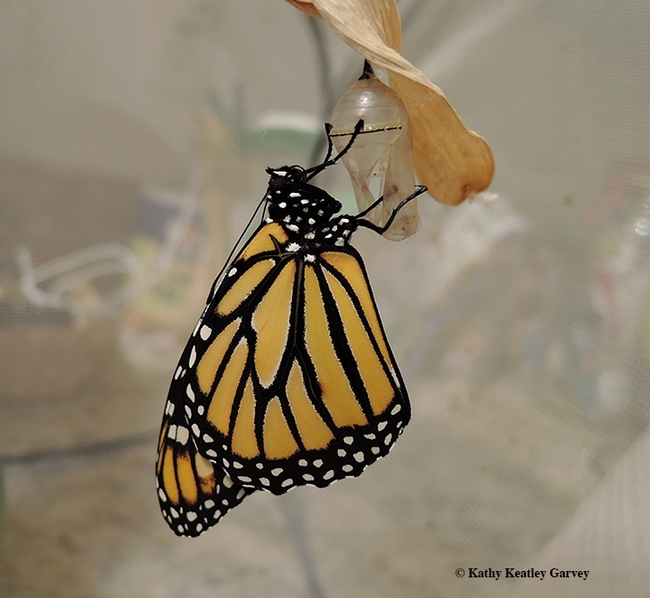 The best part of rearing monarchs? Releasing them. The lift-off, the flutter of wings, and it's time to be a butterfly.